The first comprehensive history of the Branch-Lane Brigade, based on many years of study and grounded on a vast foundation of sources that relate every aspect of the career of this remarkable fighting command. "Michael Hardy is easily one of the most prolific authors of North Carolina Civil War history. He's published books of all types, from detailed battle treatments to unit studies and local history. 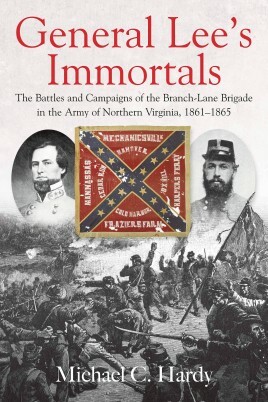 This 'first comprehensive history of the Branch-Lane Brigade,' his new book General Lee's Immortals examines the fighting career of one of the Army of Northern Virginia's most distinguished formations." “Michael Hardy’s Lee’s Immortals is a well-written and deeply researched history of the Branch-Lane North Carolina brigade. It captures perfectly its intense four years of service with the Army of Northern Virginia. Few similar commands achieved such an outstanding combat record." "This is a book with much to offer a variety of audiences. Dedicated students of the Army of Northern Virginia, the Eastern Theater, and North Carolina’s role in the Civil War should consider it essential reading. Beyond those audiences, Michael Hardy’s considerable expertise ensures that this volume has something new to teach readers and scholars with a variety of interests. Combining rigorous research and an innovative organization, General Lee’s Immortals demonstrates what an exceptional unit history can teach us about the Civil War."